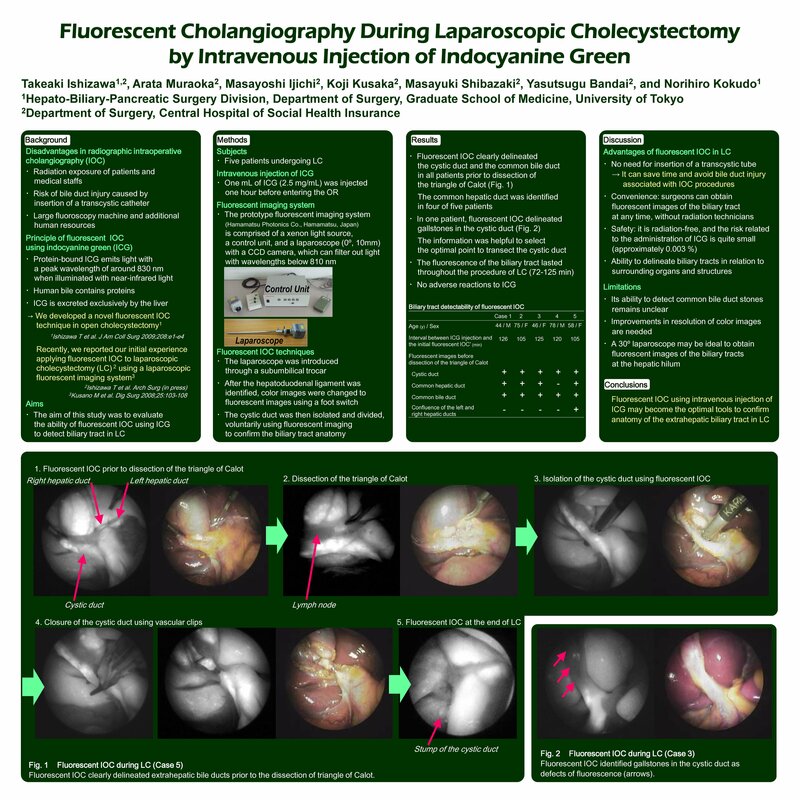 Objective of the technique: To delineate bile duct anatomy during laparoscopic cholecystectomy (LC) using fluorescent cholangiography with preoperative intravenous injection of indocyanine green (ICG). Methods: Our fluorescent cholangiography technique is based on the principle that ICG is excreted into bile and that protein-bound ICG emits light with a peak wavelength of around 830 nm when illuminated with near-infrared light. The prototype fluorescent imaging system is comprised of a xenon light source, a small control unit, and a laparoscope 10 cm in diameter with a charge-coupled device camera, which can filter out light with wavelengths below 810 nm. In 5 patients undergoing LC for cholecystolithiasis, one milliliter (2.5 mg/mL) of ICG was intravenously injected two hours before surgery. The abdominal cavity was insufflated, and the laparoscope was introduced through a subumbilical trocar. After the hepatoduodenal ligament was identified, color images were changed to fluorescent images using a foot switch. Preliminary results: Fluorescent cholangiography clearly delineated the cystic duct and the common bile duct in all patients prior to the dissection of triangle of Calot (Fig. 1). The common hepatic duct was identified in 4 of the 5 patients. In one patient, fluorescent cholangiography delineated gallstones in the cystic duct and the information was helpful to select the optimal point to transect the cystic duct (Fig. 2). The fluorescence of the biliary tract lasted throughout the procedures of LC (72-125 minutes). No adverse reactions to the ICG were encountered. Conclusions: Fluorescent cholangiography using intravenous injection of ICG may become the optimal tools to confirm the biliary tract anatomy during LC because it has potential advantages over radiographic cholangiography in that it does not require irradiation or dissection of triangle of Calot. Figure 1. Fluorescent cholangiography delineated anatomy of the extrahepatic bile ducts prior to the dissection of triangle of Calot. Figure 2. The gallbladder was not fluorescing because of gallstones in the cystic duct (arrow).